CLASS XI. BROKEN COTTAGE TULIPS. 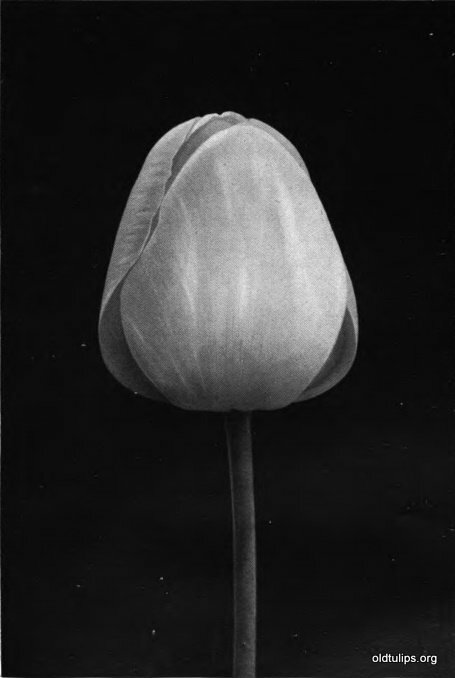 The 'Types' are the same as those of Cottage Tulips, Class IV, (p, 38), and they are similarly arranged in colour sequence. type 1.�Cup-shaped, e.g. 'Bouton d'Or' Fig. 1. 2.�Pointed, e.g. 'Mrs. Moon' Fig. 2. 3.�Egg-shaped, e.g. 'John Ruskin' Fig. 3. 4.�Segments reflexed, e.g. 'Retroflexa' Fig. 4. In this Class the varieties are arranged as they might be in a border so that they form a sequence with the most typically coloured flower of the section about the middle and thence grading of� towards the sections above and below it. a. Roses. -- Definition: Rose markings on white ground. Striped Beauty, Zomerschoon. b. Bybloemen. -- Definition: Purple markings on white ground. Twilight, Union Jack. c. Bizarres. -- Definition: Brown, red, or purple markings on yellow ground. Chameleon, Gala Beauty, Scotia. Cottage Tulip Shapes: Image Captions -- left to right: Figure 1: Cottage Tulip � 'Bouton d�Or' (described as cup shaped); Figure 2: Cottage Tulip - 'Mrs. Moon' (described as pointed). 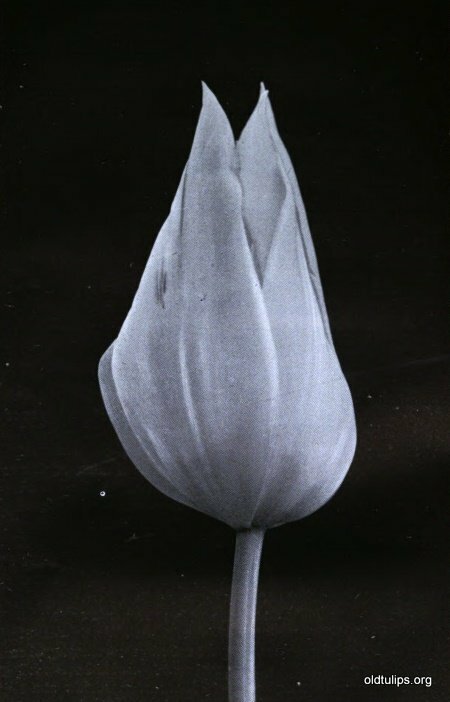 Figure 3: Cottage Tulip � 'John Ruskin' (described as egg-shaped). 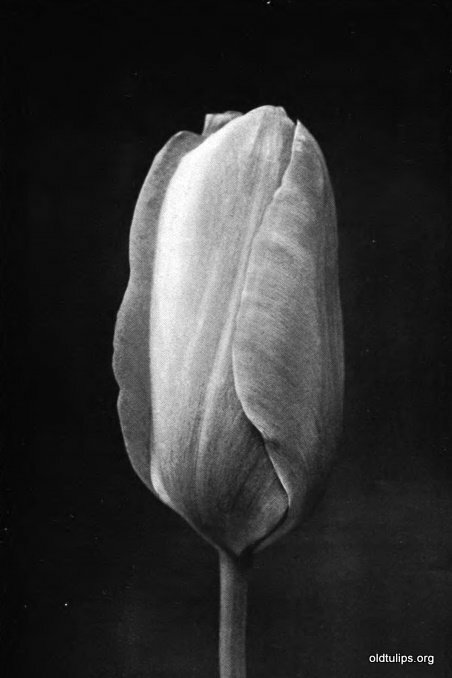 Figure 4: Cottage Tulip � 'Retroflexa' (described as segments reflexed). Click images for larger versions. Striped Beauty.�Type 2. Form and substance fair; white, with a heavy flame which varies from rose-red to pink; base white, with a blue ring; 21 inches; May 6, 17 days. Zommerschoon.�Type 3. Finely marked salmon-rose on cream, inside clear salmon when young; base yellow; 26 inches; May 15, 15 days. A very beautiful old variety. See also under Surviving Broken Tulips section of this website. La Panach�e fol. var.�Type 2. Form and substance fair; pink, heavily flamed with Tyrian rose; base white, with a blue bar on each of the outer segments; 20 inches; May 10, 14 days. Gesneriana Bridesmaid.�Type 2. Form as in 'Gesneriana ' (IV. ); rose, streaked with carmine and white; base circular, blue; filaments blue above the middle; 21 inches; May 12, 14 days. Parisian Aurore.�Type 1. 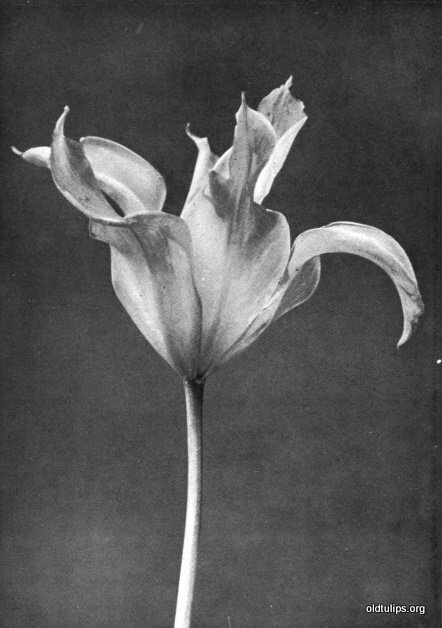 Form and substance fair, flower long; 24 inches; May 8, 19 days. Coquette de Belleville.�Type 1. 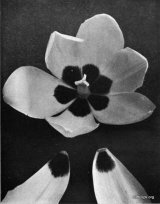 Form and substance fair; rose- red, with white margins; outside dull; base large, white, with a purplish margin; 19 inches; April 29, 19 days. Gesneriana striata = Gesneriana Bridesmaid, q.v. La Ravissante = La Panach�e, q.v. Marie de M�dicis = La Panach�e, q.v. Maid of Holland = Gesneriana Bridesmaid, q.v. Summer Beauty = Striped Beauty, q.v. Union Jack.�Type 1. Form and substance fair; violet, heavily streaked with purple; base small, white, fringed with blue; 21 inches; April 29, 20 days. Belle Lisette.�Type 1. Form and substance fair; white, flamed rose-red; 19 inches; April 29, 18 days. Twilight.�Type 1. Form and substance fair; purple, streaked with deeper purple and white; base light, marked with dull blue; filaments with a blackish ring at the apex; 22 inches; May 3,17 days. Rouge �blouissante = Union Jack, q.v. Chancellor.�Type 3. Form and substance fair; buff, heavily feathered below the middle of each segment with purple; base lemon- yellow; 20 inches; May 8, 16 days. Chameleon.�Type 1. Form and substance fair; yellowish white, suffused light purple, and heavily streaked dark purplish red. Gold Flake.�Type 3. Form and substance fair, orange-scarlet; base circular, with an olive ring; 24 inches � May 8, 17 days. Scotia.�Type 1. Form and substance fair; light yellow, heavily streaked with light red; base blotched with olive; filaments olive above the middle; 21 inches; May 8,16 days. Gala Beauty.�Type 2. Form and substance fair; flower bright yellow, heavily flamed with carmine; outer segments reflexed at tips; 22 inches; May 10, 15 days. Flamed Crown.�Type 2. Form and substance fair; pale yellow, with beam of dull carmine; base fringed with olive; 21 inches; May 6, 16 days. Billietiana L'�blouissante.�Type 1. Form and stature of ' Billietiana '; lemon-yellow, heavily flamed with scarlet; 21 inches; May 10, 18 days. Pontifex maximus.�Type 2. Form and substance fair; yellow, flaked scarlet. Goldmine.�Type 1. Form and substance fair; dull purple Bizarre. Boyne.�Type 1. Form and substance fair; mahogany-red Bizarre; 19 inches; May 16, 12 days. Brilliant.�Type 2. Form and substance fair; scarlet Bizarre . base marked with olive as in Fig. 11. Image Caption - Figure 11: Cottage Tulip � 'Strangulata Primulina', base black. Click images for larger versions. Red Crown.�Type 2. Form and substance fair; orange-scarlet; Bizarre; base large, yellow; 21 inches; May 10, 14 days. Torch.�Type 1. Flower small; form and substance fair; pale yellow, flushed with scarlet; base blotched olive; filaments greenish; 19 inches; May 10, 17 days. Buenaventura.�Type 2. Flower small, form and substance fair; scarlet, flaked with deep yellow; base deep yellow; 18 inches; May 6, 18 days. Gloria Mundi.�Type 1. Flamed scarlet on yellow; a rectified Tulip; 18 inches; May 5, 19 days. Fire Dragon.�Type 1. Large, form and substance fair) light yellow, flamed purple and carmine; 25 inches; May 7, 19 days. Royal Visit.�Type 1. Form and substance fair; deep red, with margins of yellow; base deep yellow; 23 inches; May 10,14 days. Orangeman.�Type 2. Form and substance fair; feathered scarlet Bizarre; 21 inches; May 14, 13 days. Cyclops.�Type 1. Flower small; form and substance fair; out- side carmine, inside scarlet; base yellowish; 23 inches; May 6, 18 days. See also 'Goldfinder' (a synonym) under Surviving Broken Tulips section of this website. L'Hermite.�Type 2. Form and substance fair. A broken form of ' La Merveille '; 24 inches; May 10, 15 days. Eyebright.�Type 2. Form and substance fair; scarlet Bizarre; base streaked olive; 24 inches; May 10, 14 days. Abdul Aziz = L'Hermite, q.v. Columbus = Gala Beauty, q.v. French Crown = Gala Beauty, q.v. Orange Quee = Torch, q.v.